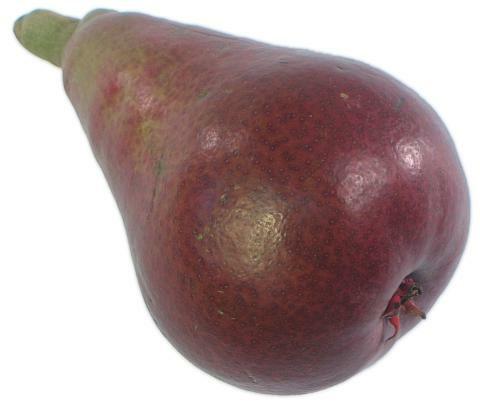 General Information: The Starkrimson pear is a brilliant and solid red. As it ripens, it may turn even more brilliant! This variety shares similar taste and texture to the Bartlett pears, but may have a more noticible floral note to its aroma and taste. Starkrimson pears are becoming easier to find around the country. Applications: In nearly all respects, Red Summer Pears (Red Bartlett, Starkrimson and other red Pears) are nearly the same as Yellow Bartletts. Summer Reds add a beautiful contrast of color in fruit baskets and bowls, while providing the familiar flavors and smooth textures of Yellow Bartletts. History: The Starkrimson also originally occurred as a sport, or a spontaneous mutation. It was discovered in Missouri as a branch of red pears growing on a tree of Clapp's Favorite. The discovery was made in the early 1950's. In 1956, this beautiful red pear was patented by Stark Brothers Nursery and propagated by that firm, hence the name Starkrimson. Because it takes roughly six to eight years for a young pear tree to bear any notable volume, it was a few years before the variety caught on. Now more orchards are bearing this variety in abundance, and the Starkrimson is becoming an easy to find variety in produce markets.